Life is not without its ups and downs. I think the key is the fact that I believe in hope. No, life is not always peaches and cream. For most of us, in many phases of life, our days can be filled with problems and challenges, pain and worry. And yet, there’s hope. And our stories often give rewarding examples of that. Though our characters are fictional, the problems their conflicts demonstrate are very human and real. Our readers can identify with the struggles. So when their strengths outweigh those hurdles, and love prevails, it can be both exhilarating and inspiring. I love that. Many times, reading a deep and moving story has lightened my burdens, and recharged my batteries. And I’ve heard from readers reporting the same reaction. In our world today, one issue that is touching many lives is Post Traumatic Stress Disorder. Many times resulting from war stresses and experiences, our courageous returning soldiers are struggling to regain a normal life. The disorder can vary from slight anxiety and triggers, to overwhelming sensory reactions to sounds, smells, sights, and memories. Depression, sleep disorders, nightmares, and personality changes, are only a few of the ways it’s hard to cope. But it’s not only war that causes this disorder. Other traumas, losses, victimization, accidents, natural disasters, and long term abuse can also result in these symptoms. Holidays can be an especially hard time for those who suffer PTSD, as well as for the people who love them. While the trauma can happen in the flash of a minute, the recovery from it is a long, slow process. But recovery and healing can happen. And love sure helps. In my new novella, “Christmas Laurel”, Laurel is a retired veteran with PTSD. 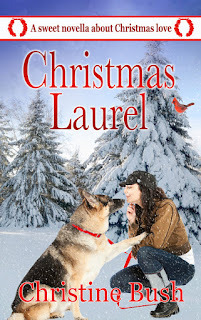 With her dog, “Duck”, a retired bomb dog, who also served in Afganistan, she travels to a remote cabin in North’s Carolina’s Smoky Mountains to avoid any signs of Christmas. The whole season triggers her worst reactions, and she just doesn’t want to deal with it as she continues to work on healing. But Christmas has a way of changing hearts, along with the handsome mountain man who lives in a nearby cabin, and has ghosts of his own he’s had to face. I wrote this story of hope and healing and love because it’s an important topic. Life can be very, very hard. It can break our hearts. It can knock us off balance. But there is hope. We can heal, and go on to live our lives in a bright, redefined way. We can find love in life again. If you or someone you love is suffering this holiday season, I wish you healing and hope. Beautiful way to make your point, Christine. It's why I do it, too. If I want to escape, I want to know there's a happy ending, no matter how rough the road is. Thanks, Christine. I want to escape and know at the end there will be a happy ending. It lifts my spirit. Happy endings give us hope. Beautifully put, Christine. It's great that you can take all the emotion and angst that you must see every day in your job and turn it into uplifting stories. Thanks! Here's to 'happily ever afters' !